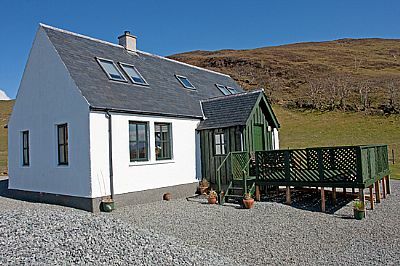 Our bookings for 'Cnoc an Theine' are managed using CottageGuide.co.uk, the UK's premier holiday cottages web site. Although the calendar shows a 12 month available for 'Cnoc an Theine' we are delighted to make reservations at any time in the future. click on the photo below that will take you to PayPal where you can arrange a transfer. Our full terms and conditions are shown below. Please ask for further information if required. Bookings are accepted following the completion of the Booking Form along with a 25% non returnable deposit. The balance to be paid one month before arrival. For bookings made than less than 4 weeks, full payment is required at the time of the booking. Acceptable methods of payment are: cheque, cash, or GBP travellers cheque or PayPal. Cheques should be made payable to Mags Macdonald. The let commences from 4pm on the day of your arrival and terminates at 10am on the day of your departure. The cottage to be used for holiday purposes only and to the persons named on the booking form. Should a cancellation be made by the guests, we will seek to relet the cottage for the period of hire. A full refund will be made providing we are successful in re-letting the cottage. If the cancellation was less than 4 weeks prior to commencement of the let and we are unable to re-let the property - a fee of 50% will be kept. Clients are advised to take out a Holiday Cancellation Insurance Policy. For insurance purposes, the number of people occupying the premises must not exceed the number of beds provided in the accommodation. We shall have no liability for any death, personal injury, damage or loss of personal property unless the results from our own negligence. Electric, fuel (oil, coal and wood) linen, towels are included in the let. A well behaved dog is welcome in the cottage, but must be kept closely controlled both within the cottage and when being exercised. Please ensure that on departure you do not leave any trace of animal hair or other related mess. Animals are not permitted on the furniture, bedrooms or allowed upstairs. Guests should take proper care of the property, furniture and fittings and leave the cottage in the same clean and tidy condition as it was found upon arrival and to report any damage and breakages before departure. This is a strictly no smoking house. We reserve the right to enter the cottage at all reasonable times for the purposes of inspection or to carry out necessary repairs etc. The contract of let is between the hirer and I R & M Macdonald the owners of the cottage.